Now here is a symphonic death metal band to be reckoned with. Ygodeh have a crushing sound that pulverizes ear drums as it crashes through the heavy portions, yet that can also be beautiful and almost spiritual. A band of contradictions, Ygodeh pull it all off with aplomb. 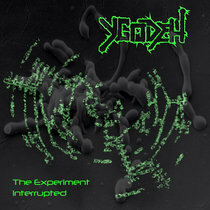 Their new record The Experiment Interrupted represents a band who know how to put together a variety of sonic elements to create something new and exciting. The way they use their orchestral parts to add tension is impressive. I really love the way they then fuse this perfectly with the death metal sections. Very few bands can claim to have this kind of musical skill, and Ygodeh transcend the common boundaries. Long story short, the songwriting is brilliant and the pieces easy to listen to. These guys don't make the common symph death mistake of creating a sound that is so esoteric it alienates potential fans, yet the musical chops are clearly excellent. Suffice to say, I would like to hear more from these guys, they certainly know how to create some of the best symphonic death metal on the market today, so what's stopping them from becoming huge?